Celines Toribio at the launch party for Emilio Estefan's book, "The Rhythm of Success: How an Immigrant Produced his own American Dream." Celines Toribio at the People En Espanol's "50 Most Beautiful" Event. Armando Correa, Celines Toribio and Lucia Ballas-Traynor at the Hispanic Heritage Month with Fiesta 2009 People En Espanol Celebration. Celines Toribio at the People En Espanol's 4th Annual "50 Most Beautiful" Event. Celines Toribio at the 15th Annual Race to Erase MS Event. 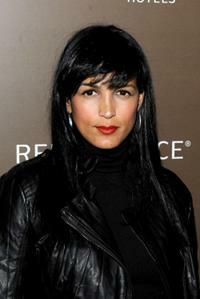 Celines Toribio at the premiere of "The Dry Land." Zoe Saldana and Celines Toribio at the People En Espanol's "50 Most Beautiful" Event.